Although I attend well to social networking when it comes to others, I admit to falling off shamefully when it comes to my MySpace page. Today is an attempt to make up for that a bit. While I do manage to fairly well keep up both my personal and professional facebook pages, MySpace gets shoved to the back burner, mainly because the work I do from there is species specific … it’s almost exclusively about musicians and I’ve rather gone off them lately due to a nasty taste in my mouth, the residual of scummy duplicity. A couple of vids crossing my radar today bring slight guilt pangs of neglect, however, so it’s “contribute to MySpace day” … unofficially, of course. I’m a strong supporter of independence in the music industry and well pleased that technology has made it easier for artists to share and spread their talent, keeping the monster that has been the record industry from dictating every who, what and where as had been the case for too long. There’s a lot of truly great stuff about, and finding and following those making it can now happen even when the band you’re presently into is on the other side of the planet and relatively unknown. Although all strive for superstardom … and, btw, I do onesheets, bios, liner notes, etc. for those musically gifted, but literarily challenged … digital distribution offers the option of importing music without the filter of mega-companies deciding what’s available for your personal consumption. Through YouTube vids, MySpace and facebook shares bands can go viral, and thousands may be brought into the fan fold, well pleasing not only those who saw fame coming, but also the artists who start making the big bucks. As a service to my MySpace musician clients and buddies, I’m offering up a couple of videos that could prove helpful as the illusive fame thing happens. The fact that they make me laugh … having had the sort of experiences via musicians these address … is bonus. Oh! The groupie … and talk about that nasty taste in the mouth! a tad confusing listening to someone from Mixed Martial Arts say he’s not a fighter…..duh. The groupie was sad but the cartoon was right on the money. 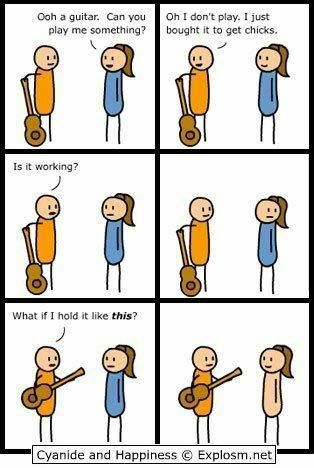 Very funny….the groupie and the comic! Don’t know the first guy though. HAHAHAHA!! I burst out laughing when I read your reply, Sandra. I was going to say I thought he was a bit of an toidi.